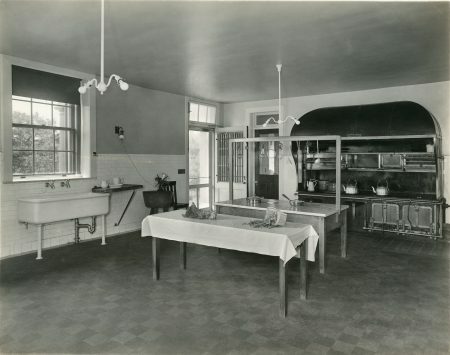 Kitchen at Nemours, undated. Nemours Estate Archive. Historic estates are living in a post-“Downton Abbey” world and visitors frequently ask about the domestic staff. Interpreters usually have one or two factoids to share, but traditionally, sites haven’t spared too much thought about the men and women who occupied the margins of the larger “estate” narrative. Yet the newest challenge facing many of us in the field is how we can locate these invisible actors within the social and economic (not to mention physical) landscape of the household. At Nemours, the historic estate of Alfred I. duPont in Wilmington, Delaware, I am engaged in an ongoing graduate student project to create an interpretive narrative about the domestic staff. I’m tracing them from the early days of the duPont’s residency through periods of marriage, family, war and death, ending in 1970. Throughout the decades, many types of people came to live and work at Nemours, some traveling from as far as Sweden and others coming in from the neighborhood. While many identities can fortunately be recovered through payroll records and census data, I’m often left with more questions than answers. Therefore, I’d like to share some of my struggles and strategies for breathing new life into the long-departed staff. The name Eleanor Pack began surfacing on the duPont payrolls in 1933 as a Lady’s Maid. As most early twentieth century guides to the domestic economy will tell you, this position was among the highest paid and most intimate. Lady’s Maids worked exclusively with the mistress of the house to service her daily needs. I know very little about Eleanor Pack—she worked for Jessie Ball duPont until the early 1950s and passed away in 1954. She was English, and received a steady raise in her wages throughout her tenure, remaining a loyal companion to Mrs. duPont in her later years. Jessie’s diary mentions Eleanor only a few times: once in 1947 to note that Eleanor was studying for a license in massage, and then later to record that Eleanor had given her a massage. After accompanying Jessie on an outing in Europe, she wrote that “Eleanor enjoyed the trip as much as we did!” Unfortunately, that’s really all we have about Eleanor from those diaries. I think about Eleanor Pack a lot as I work through letters between the duPonts and their staff. I know quite a bit about the superintendents and chauffeurs of the estate—all male–but what do I do with an absence of a voice in the archives? There are certain ways that a historian can reconstruct a person’s life. As I previously noted, primary source accounts like treatises on household management provided descriptions of domestic labor and instructed mistresses in proper management of their staff. I also have the duPont’s own rules and regulations for the household. I know when Eleanor ate, what the cook prepared for the staff meals, when she had free time to go to the movies, and that she accompanied the duPonts to their Florida estate Epping Forest nearly every winter. Oral History also yielded some interesting tidbits, a strategy that most historic house professionals would be wise to adopt. Accounts taken of the children of employees who actually grew up on the estate provided some of the most beneficial and personal data for my narrative. We know through the son of James Dolan, one of the estate’s chauffeurs and longest-serving employee, that Dolan and Eleanor Pack accompanied the duPonts on their travels. It became a long running joke within the Dolan family that the duPonts didn’t normally pay for the unmarried Eleanor and married Dolan to have separate rooms. From the oral account of James Dolan Jr., I know that while the relationship between Eleanor Pack and Jessie Ball duPont was affectionate, even perhaps familial, the reality of their employer-employee relationship often made itself known in these subtle and careless ways. 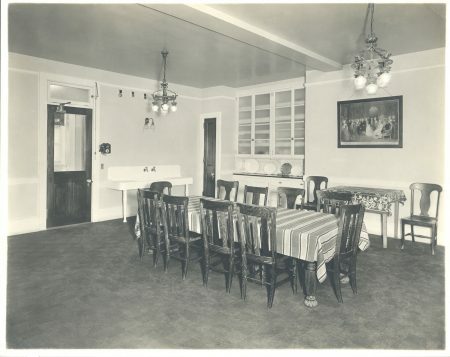 Servant’s Dining Room at Nemours, undated. Nemours Estate Archive. My research into the domestic staff at Nemours also led me to consider demography. The duPonts followed in the footsteps of other wealthy American estates by employing immigrant men and women. Roughly half of the domestic staff at Nemours were foreign-born and hailed from the British Isles, Central Europe and Scandinavia. When Jessie Ball duPont became mistress of the estate in 1920, she put an ad in the paper stipulating that applicants for domestic employment be “Protestant, English, or Scottish.” Irish girls were notably left off this list, reflecting larger ethnic and religious biases of the period. This says much about how the duPonts may have conceptualized English-born Eleanor Pack. Pack represented an ideal Lady’s Maid by virtue of her perceived respectability and ethnic credentials. Researching domestic staff provides wonderful opportunity for innovative interpretation. Oral history, material culture, social history and demography each provide a means of telling the story of the men and women who worked at Nemours, and I imagine they might work for any other historic estate. Looking beyond the traditional “Great House, Great Men” narrative lets us tell a multilayered story of race, ethnicity, class and gender through a single site. 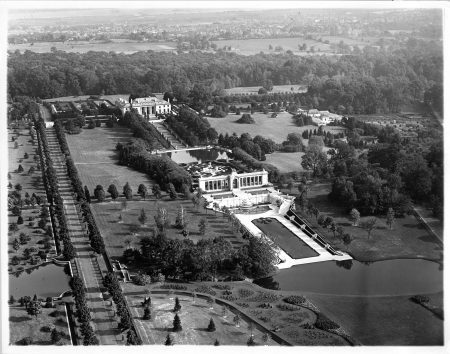 I myself hope to move Eleanor Pack out of the margins of the Nemours story and into the minds of every visitor who enjoys the estate in the future. Editor’s Note: For more resources on interpreting domestic servants at historic sites, check out this free recording of AASLH’s recent webinar Interpreting Servants. Want to write for the AASLH blog? Learn more and submit an article here.